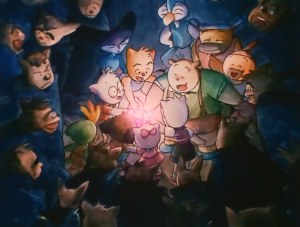 On October 13th 2012, the official website for Tomcat’s Big Adventure put up a three-part interview with renown art director Hiromasa Ogura. He talks about his early career, Tomcat’s Big Adventure (of course), Royal Space Force, Ryūtarō Nakamura, Mamoru Oshii, Gainax, and much more. Given the sheer length of this interview and the many names referenced, this translation was absolute torture. I’m just an amateur though so what do I know. Against my better judgement, instead of separating the interview into three parts, I’m just going to put it all on this one page. Unlike all the other stuff I’ve put up on this blog thus far, the footnotes here are actually from the original interview. Thank goodness. Normally I have to go out of my way to hunt down additional context. Usually I’d add extra footnotes for Japanese specific terms but I’d prefer not to have two separate sections of footnotes. Use the search engine of your choice and you should be able to find a quick summary. Thank you very much to whoever conducted and wrote up this interview for Tomcat’s Big Adventure: Tom’s World. 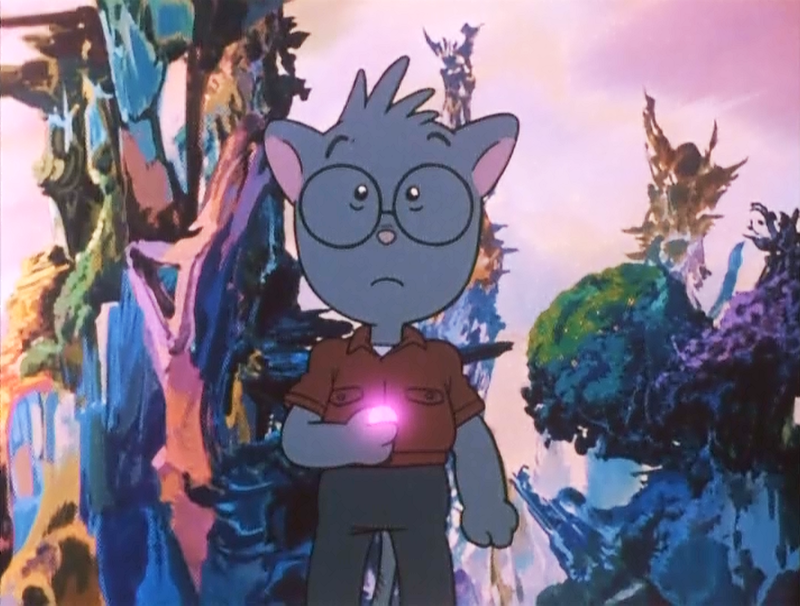 It sure would be swell if Tomcat’s Big Adventure was screened somewhere in the US so I could actually go watch it. Anyway, I hope you enjoy the interview. Hiromasa Ogura, art director for several landmarks of Japan’s animated film history, such as Royal Space Force: The Wings of Honnêamise and Ghost in the Shell. 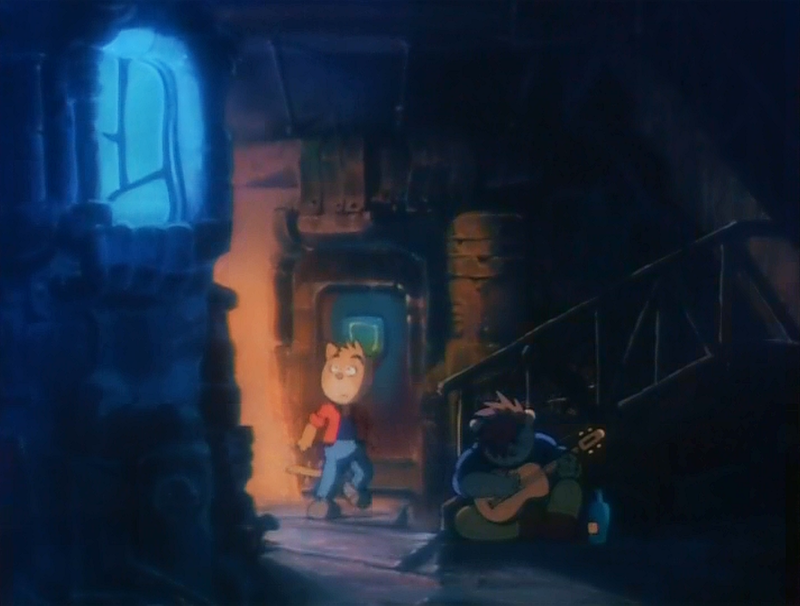 Just how did he craft the gorgeous backgrounds in Tomcat’s Big Adventure ? After all this time he had held onto the original paintings and graciously took them out of storage for us to see, as we conducted this interview that took over two and a half hours to find the answer. 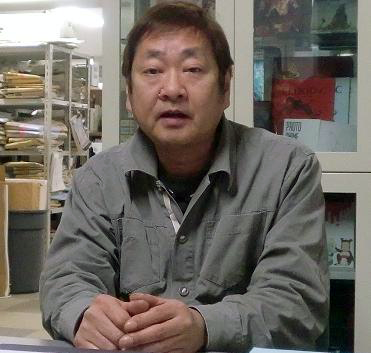 Hiromasa Ogura, born in 1954, entered Kobayashi Production in 1977. 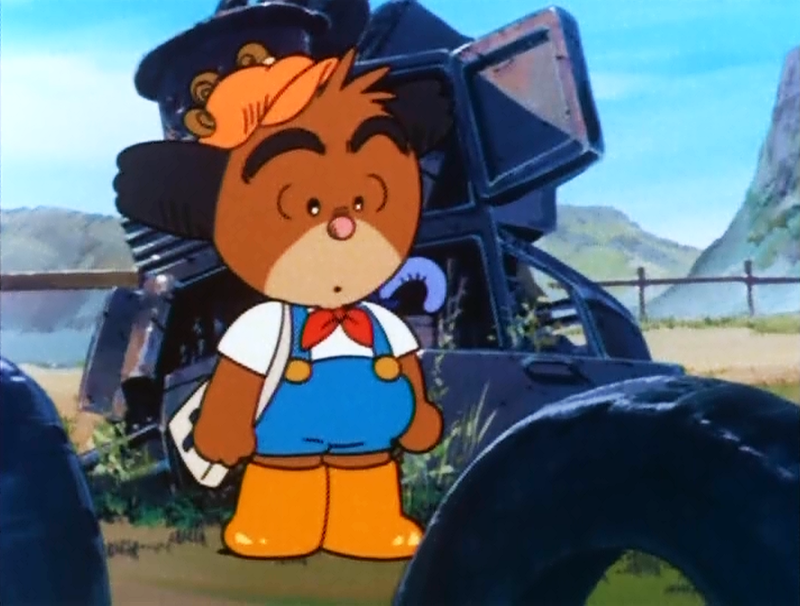 His career began with the backgrounds of 3D Animation: Nobody’s Boy Remi. Afterwards, he painted backgrounds for Treasure Island (1978), Tomorrow’s Joe 2 (1980), Lupin III: Castle of Cagliostro (1979), Aim for the Ace! (1979), Harmagedon (1983), and others. He left Kobayashi Production in 1983, and founded Studio Fuga with colleagues Hiroshi Ohno and Toshiharu Mizutani. He debuted as an art director with Royal Space Force: The Wings of Honnêamise (1987). In 2007 he founded Atelier Ogura Co., Ltd. Today he is considered to be one of the leading anime background artists. Representative Work: Patlabor: The Movie (1989), Patlabor 2: The Movie (1993), Ghost in the Shell (1995), Jin-Roh: The Wolf Brigade (1999), FLCL (2000), Ghost in the Shell 2: Innocence (2004), xxxHOLiC (2006), Strike Witches (2008), Blood-C (2011), and many others. 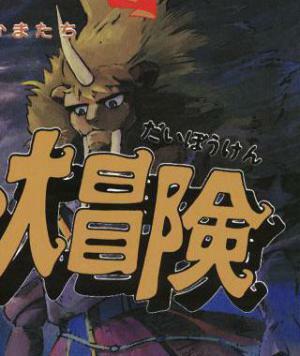 As far as work that Ryūtarō Nakamura directed besides Tomcat, Ogura also served as art director on Ghost Hound (2007). An art director carefully thinks about the “world” of an anime and depicts it in a way that weaves together the characters, the mecha, and the story. Art directors paint art designs that serve as the basis of the worldview and the background art. It is through these designs that an anime director’s ideas of the world are conveyed to the rest of the staff. 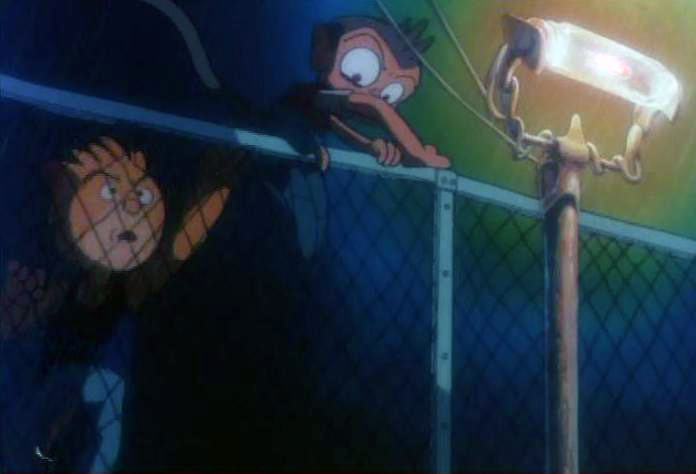 In addition to painting backgrounds themselves, art directors serve as quality control for the backgrounds of shots assigned to the other background artists. I sure was active back then in my early 30s (laughs). ● How did you get involved with Tomcat’s Big Adventure ? It all started when (Yoshimi) Asari from Triangle Staff  reached out to me. When I began, a bit of progress had already been made on small portions of the production, such as the storyboards. Based on the character reference sheets and layouts  from the recruited key animators at the time, I started painting some image board-esque art. Then the key animators and some others involved up until this point left the project. It continued under myself, Ryūtarō (Nakamura), (Manabu) Ohashi, and color coordinator  (Yumiko) Katayama. But I don’t really remember the latter half all that well. It was just never-ending work until my contract was up, and I think even then there was still some leftover work to be done. I took the leftover work back to my own workplace. I was pretty swamped but I felt like I had to do something about it. ● In the movie itself there are no credits for who assembled the production staff together, but it seems like it was basically Triangle Staff? Yeah that should be the case. Along Itsukaichi Road, Nishiogi (Suginami Ward), an apartment was rented out and repurposed as a studio for the production of Tomcat. Normally it would be used as a place of residence, but Katayama and animation checker (Kumiko) Ohtani lined up animation desks inside the rooms among other things. It wasn’t a private room per se, but I was given a space that resembled an art director’s room. ● They really assembled quite a remarkable group of people for Tomcat. (While looking at the production staff list) Yeah just look at these key animators. 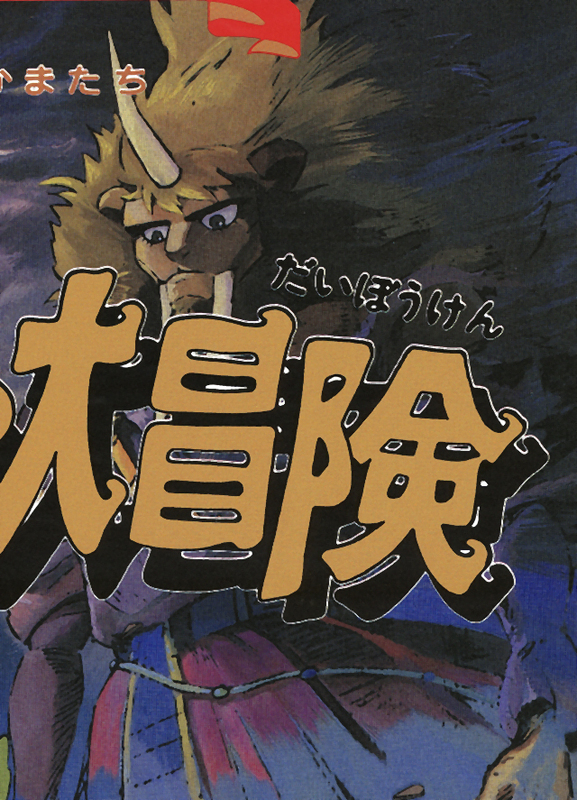 I had no idea (Makiko) Futaki and (Hiroyuki) Okiura worked on this. Well, at the time we weren’t even acquaintances (note: Hiroyuki Okiura directed Jin-Roh: The Wolf Brigade, for which Ogura served as the art director). I also also wouldn’t have seen them since there weren’t really any animation meetings for me to attend. 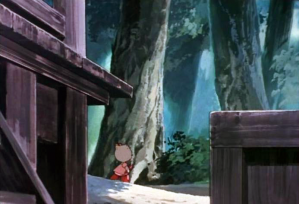 Although he used to paint backgrounds, nowadays (Kenji) Kamiyama is known as a director. He was once my junior at Studio Fuga (see profile) (laughs). I wonder if Studio Fuga was involved. Beyond (Yukihiro) Shibutani, several people from Ishigaki Production  may also have been involved. Back then (Tokuhiro) Hiragi was still doing backgrounds. He doesn’t do them anymore now though… (Tatsuya) Kushida still does backgrounds now though . ● At this point, you had already left Fuga and went solo right? Yes, I came on board by myself. Soon after Royal Space Force: The Wings of Honnêamise (1987), I resigned from Fuga. I really wanted to work on (Mamoru) Oshii’s Twilight Q: Mystery Article File 538 (1987). At the time, they didn’t want want to get involved in that project, but I did. So I left (laughs). Then after Mystery Article File, I worked on the Patlabor OVA series (note: the original 1988 series now known as Early Days). Early 30s. I sure was active back then (laughs). ● Tomcat’s Big Adventure was officially finished in 1992, but the actual production took quite a long time to complete. Time-wise it looks like it would have conflicted with the production of Patlabor: The Movie (1989)? 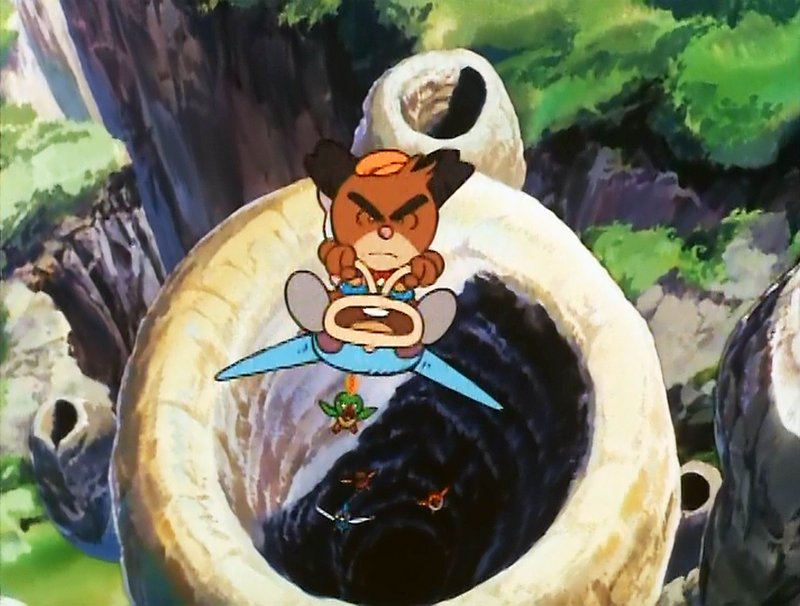 Now that I think about it, Nadia: The Secret of Blue Water (1990) was also around that time. Back then, I had to finish the background artwork for movies in about half a year… but Tomcat still ended up taking a long time. From spring to summer… Hmm, did it really take that long? I recall working on it in the heat of the summer. I don’t think it took a whole year, but I feel like I worked on it into the succeeding year. ● Did you end up working on Tomcat longer than you normally do for a movie? After I joined, I was particularly focused on the work until the latter half I think. Definitely. But for the last portion, I think I brought the work back to my own workplace. The reason I can hold this background art in my hands right now is probably because back then I took it with me. Outside of the stuff I was particularly fond of, I left the materials at the production company. At the time, cels and the like were treated as production materials that had to be disposed of. Although I don’t know what happened to the materials I left at the production company, I can guess given the aforementioned industry practice. ● Was the production of Tomcat’s Big Adventure the first time you met director Nakamura? Hmm… I think so. Was there something else before that? 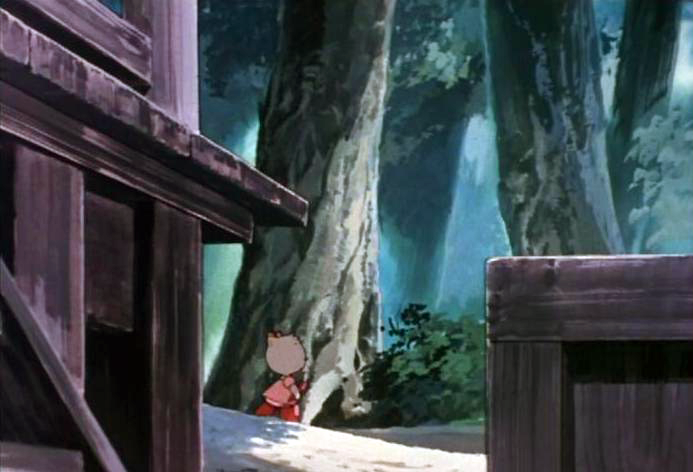 ● In my head I built up this idea that maybe Nakamura did the key animation layouts and you did the backgrounds for some of director Osamu Dezaki’s projects from 1970 to 1980 (laughs). I think back when I at Kobayashi Production , Nakamura was at Madhouse? So when you ask me if it was the first time I met him, technically I’d heard his name before and I’d seen him at the end-of-project party for some other projects. That’s right. I first became acquainted with Asari at Madhouse. Before that, Asari was at Sanrio right? 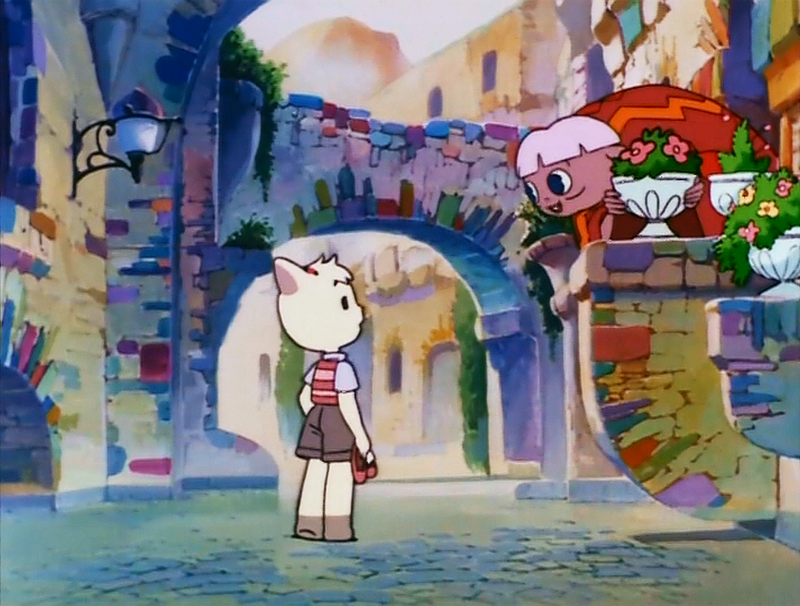 During Unico 2 (Unico in the Island of Magic (1983)), Asari was on loan from Sanrio to Madhouse. At the same time Asari also worked on Harmagedon (1983) . That was right around the time I’d left Kobayashi Pro, and I helped my seniors (Kazuo) Oga with Harmagedon and (Katsushi) Aoki with Unico 2. Then after a brief stint at Ishigaki Pro, I went to Fuga… or something like that. Regarding Royal Space Force: The Wings of Honnêamise, I got involved due to a call from Asari, who was looking for an art director. It sounded like an interesting project and I wanted to hear more about it. So producers (Toshio) Okada and (Hiroaki) Inoue came to Fuga, and told me about the kind of work they were trying to create. It was from this conversation that I accepted the role. Yeah I really had no idea what was going on there (laughs). I was like “what the hell is up with these people?” At the time Gainax’s offices were in Takadanobaba. I was on loan from Fuga, and I drew up the image boards. When I was at their office working on this, they all behaved like students (laughs). It seemed as though they all knew each other, but from my perspective I had no idea who anyone was. I saw Daicon  at a previous company I worked for. I remember thinking, “Wow amateurs made this?” It was only later that I found out those people were the same amateurs that made Daicon. When I saw the live action movie Ultraman Returns, I thought “Hey wasn’t that (Hideaki) Anno?” (laughs) “Ahh, it was those people!” When I asked later, for RSF they’d asked (Shichirō) Kobayashi and (Takamura) Mukuo but were turned down. From there, I don’t really know the details of the conversations they had with Asari. I worked on RSF, then left Fuga, and then around the time I was working on Mystery Article File, Asari came to me and told me about plans to create a new company and what kind of anime they were going to make. It was from this conversation that I ended up getting involved in Tomcat. ● You were the art director for Tomcat and teamed up with director Nakamura for the first time. What was your impression of director Nakamura at the time? “For a big guy he sure nitpicks a lot… This punk!” and things like that (laughs). Well I was also pretty young at the time, so my impression was like “What’s this guy’s problem?” I don’t mesh well with people who come on strong. Since the initial staff of Tomcat had left the project, I might have been cautious at the time. But I do remember going out for drinks and then coming back to the studio to do work, and also chatting with Ohashi and others about the content of the movie. So the project did continue to make progress. Oh yeah he was very emotionally attached. 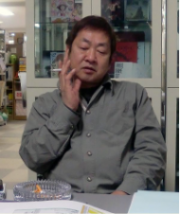 You know, during Ghost Hound (2007, Ogura and director Nakamura would reunite for this series) when I met him the conversation would turn to what happened with Tomcat… He’d blurt out, “Hey remember back then…” and so forth. I’d respond, “Oh yeah I guess so” (laughs). Yeah! (laughs) He’d say things like “Hey, remember those paintings you did for Tomcat ?” I’d think, “He’s still hung up over Tomcat ? This guy!” (laughs) “I don’t remember every little detail!” I don’t really go back and look at my own work. Especially when I just finish a piece, I end up thinking about all the things that bothered me during the production. I see it at the first screening and then I don’t look at it for a while. Only after some time has passed, on rare occasion I’ll go back and take a look at my work again. ● By the way, do you tend to mesh well with directors? There are just some people I don’t get along with. Even if I tell myself to just do my best and try, that ends up not happening… or so I’ve been told. Something just ends up going off the rails. However, for example with (Mamoru) Oshii and Ryūtarō (Nakamura), both of them relatively speaking would let me do as I please. Of course, there were times when I was told couldn’t do whatever I wanted. But outside of those particular instances, I felt like I was afforded quite a lot of freedom. ● Oh really? I had thought that director Oshii and director Nakamura were the kind of people who had a very distinct vision of what they wanted in their head, and insisted on having exactly that illustrated. But it seems like that wasn’t the case. No that’s not the case. Oshii establishes the film in his head, and then designs his storyboards to convey an approximate style that would be acceptable. After that it’s up to the actual artists as far as how the paintings and drawings turn out. Just because the characters are cute, doesn’t mean you have to paint all the backgrounds to match that particular quality. ● As an art director, what do you find most difficult? Hmm… Probably figuring out how to portray a sense of the anime that you cannot glean simply from looking at the character designs and screenplay. 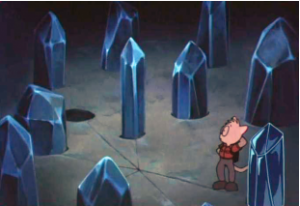 ● Did you come up with the fundamental vision for most if not all of the background art for Tomcat’s Big Adventure ? It starts with discussions between the director and myself to figure out roughly what I should be going for, and then I try my hand at the concept art to describe the visuals and atmosphere. That’s more or less how it goes. ● Were you told to adhere to some concepts or a particular vision? Just because the character are cute, doesn’t mean you have to paint all the backgrounds to match that particular quality. I think I had a conversation like this at the beginning with Ryūtarō to figure out what roughly would still work for him. It was because of this that I went for a much more realistic feel for the area with the crystals. It was something I painted at the beginning of my involvement. I intentionally thought of a darker, grittier area when thinking of a more realistic take. ● Did director Nakamura ask you to do that? No, it was something that I just felt would work. ● The depiction of Neo Gurt’s streets at night is quite mature. For an adventure story targeted towards kids, it does give off quite a realistic feel. In one scene of Neo Gurt, we see the street lights draped in rain. The actual sources of light in this scene highlight the raindrops such that the raindrops themselves appear to glimmer. This is realistic. Ryūtarō wanted only the raindrops to glimmer in the scene. We also did a test shoot to check that it appeared as intended . 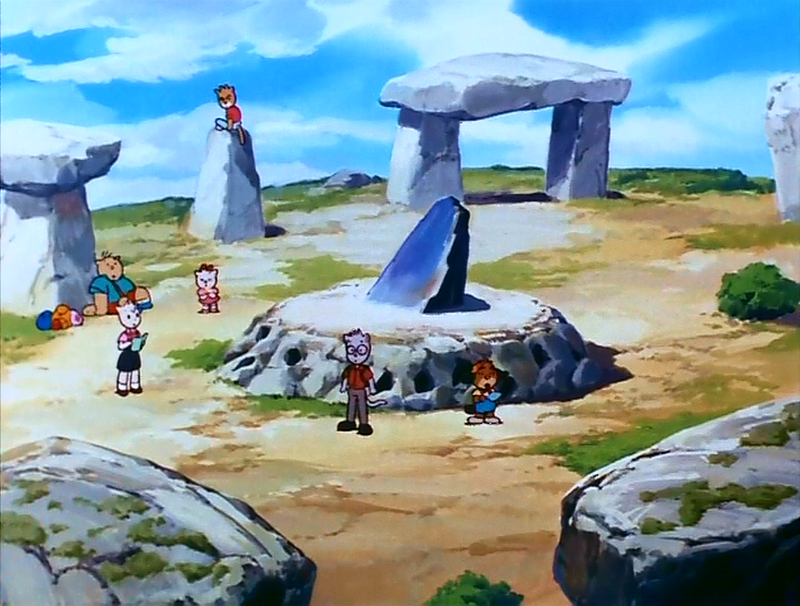 However, sometimes I did think that it would be better to convey a cutesy atmosphere depending on the location. The city that floats on top of the sea would be one such location. A variety of locations appear so in those kinds of places it fits better. In a sense, anything is fine as long as it feels fun. In discussions I had with Ryūtarō he’d say, “Ah this is great!” and we’d go back and forth like this. A scene of Neo Gurt. The city that floats on top of the sea. I’m not sure that it’s perfect (laughs). It’s just how I felt when I saw the character designs and thought I don’t necessarily have to go with the warm and fuzzy feeling. Now that I’m looking at this again, I believe that’s what I thought at the time. You can see for the flyers and posters that the background is gloomy. On this with Leonis, I used harmony  to evoke a scary atmosphere. I recall when I was starting my career as a background artist, I watched Oga work on Nobody’s Boy Remi. 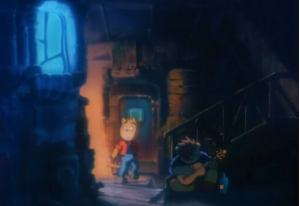 He’d adeptly paint backgrounds lickety-split, and then quickly place the cels on top. Damn that was cool (laughs). But when I first saw him do this, I didn’t understand why he was painting like this at all. Nowadays on rare occasion harmony gets used. The in-betweens drawn by animators are filled in digitally these days. 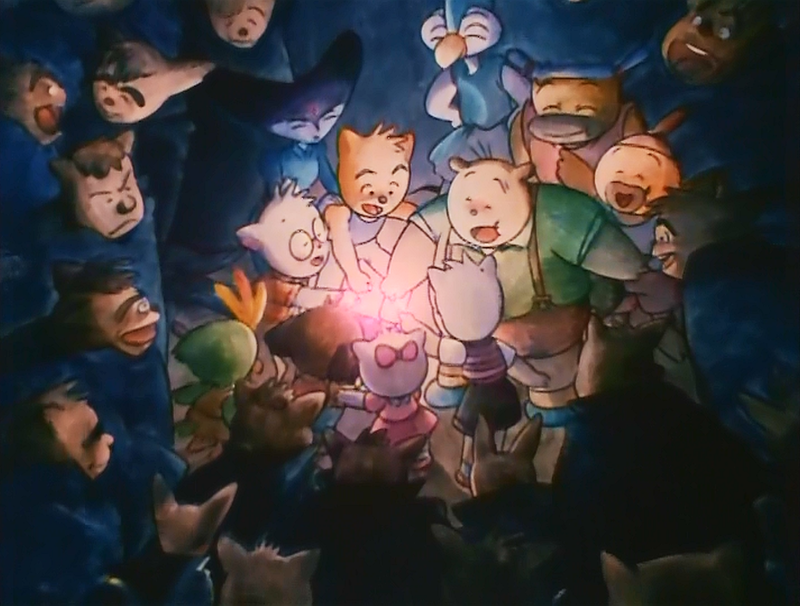 It’s too fine and clean, so it won’t evoke the feeling that the past works of Osamu Dezaki did. You need much rougher, messier drawings. But you can’t draw that way now. ● Is background art nowadays mostly painted digitally? We (Atelier Ogura) primarily still paint by hand. However, we still have to scan those paintings, so layers will be adjusted digitally. Even though that part is digital, fundamentally I still do things by hand. I do think though that digital tools speed up the work considerably. I don’t have time to stretch water color paper  for instance (laughs). 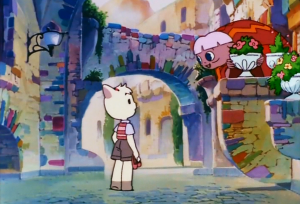 ● I really love looking at these hand-painted backgrounds. To be honest, I like looking at them even more than the cels (laughs). Of course, professionally painted cels are wonderful as well. Nowadays anime is quite varied, but there’s nothing like Tomcat. They’re not even trying to make anything like it. ● Now I’d like to ask you more about your career. From what age have you been working in the background art world? Since I was 22 years old. At the time I had not been admitted to any university. I was living kind of aimlessly, vaguely preparing for university entrance exams. Eventually I had to look for a job. Even before then I’d always enjoyed drawing and painting. So I looked for jobs that involved these activities. I looked through the job advertisements in the newspaper. At first I applied to companies to paint movie signboards and other props, but I was rejected from those jobs. Then the word “anime” caught my eye. At the time (late 70s), the fact that jobs existed for anime background art wasn’t well known. It’s not like today where you can find out about it through mass media, so I had no idea back then. I had seen anime magazines before but generally it was just character artwork that I saw. The place I called was Kobayashi Production. I was given an assignment to paint and told to bring it in the next day. Using my own imagination I painted the background art, made copies of some of my prior artwork, and brought them in. The dividers between rooms were completely removed and carpet was laid across the floor. There were also desks made of polished veneer boards. I was still young and cocky, so the idea of working at a stuffy company environment was still off-putting to me. However, when I saw the state of affairs at Kobayashi Pro, I thought it would be a fun place to work. I showed them my work and I was told to come back the next day. Actually, (Hiroshi) Ohno was also there. So that day both of us joined the company. (Toshiharu) Mizutani and (Kazuo) Oga were my seniors but at the time they had left Kobayashi Pro. When work started on Nobody’s Boy Remi (1977), they came back. I asked later, and found out that Oga was doing different work elsewhere. But sometimes he’d come to Tokyo to hang out, and was convinced to come back because there was a big project to do. Mizutani caught wind of this conversation, and also quit his other job to come back. ● Wow. I wonder what would have happened to all the masterpieces that came afterwards if Oga and Mizutani didn’t return to the world of background art (laughs). By the way, you’ve worked on a lot of titles over your career. If you had to choose one title, which would it be? Definitely Royal Space Force: The Wings of Honnêamise. 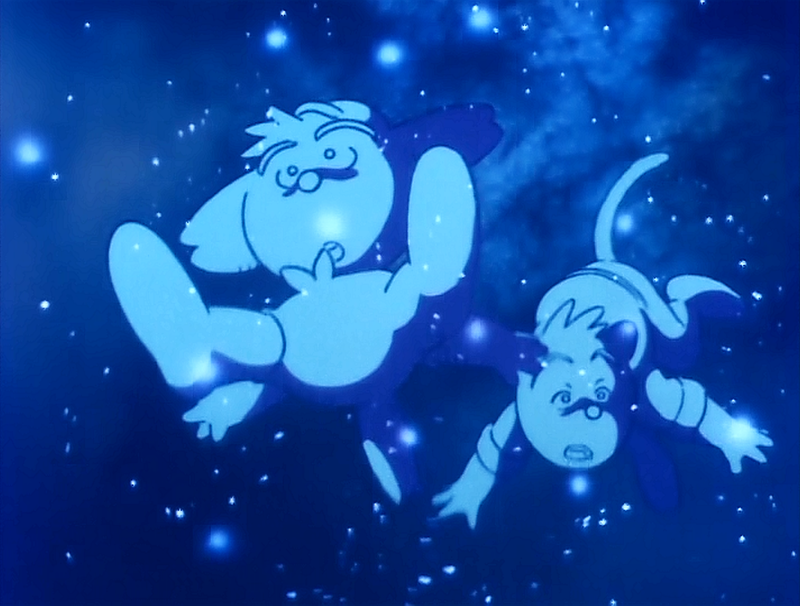 Not only was it my art directorial debut, but the now well-renown members of Gainax were so young back then. They’d keep arguing with each other, unable to reach a conclusion. A lot of things happened because those guys were so young. Director Yamaga said he wanted to distinctly portray the near future and humankind. In that sense, it was the project that made me think that this was something I could do. I said this earlier, but I rarely look over my own work again. In January of last year I watched the DVD for the first time in a while, and I was really moved (laughs). I could feel the passion. I don’t think there’s anyone out there nowadays with the same level of creative passion as those guys. RSF was really exciting. So were the people around me. Once RSF was over, I returned to Fuga, but I didn’t feel that kind of stimulation from any of the work at Fuga. Then I heard about Oshii’s Mystery Article File, and I didn’t understand it but it seemed intriguing. I wanted to work on something that gave me the same stimulation that RSF did. Well, that job turned out to be pretty difficult (laughs). It was the same while I was working on that, Patlabor, and even Tomcat, but back then I hated being told that my work tends towards the same style. That’s why I chose to work on a variety of projects, and I feel that I’ve done so. ● So it just turned out that your art directorial debut was a great movie. You didn’t pick it just because it was the debut work. Later I thought about how there really isn’t anything like RSF. Even for the design process, they’d have so many discussions about how many designs to make and how many designs to reject. Then after all of that, they’d opt to use a small portion of the designs. Back then, normally the conversation would end at “I’ll do it kind of like this.” But I thought more carefully and tried to imagine how it would turn out if I fused two different cultures. Sometimes I’d decide that although it may be interesting, it wouldn’t fit. I did this a lot during RSF. So actually I really just want to talk about that rocket liftoff scene (laughs). Even for the rocket liftoff scene I was really particular about crafting the atmosphere just right. That was really exciting to think about. In the case of Tomcat as well, my thought process was “Even with these characters it would work with these backgrounds. It should be okay to deviate from the expectations of a work targeted towards children.” I think that really drove my output. ● I see… So the background artwork you did for Tomcat gave you the same excitement that great titles like RSF and Patlabor did. With RSF as your first pick, are there any other titles which left a noticeable impression on you? Patlabor, Jin-Roh: The Wolf Brigade, FLCL… It was quite hard to match those unique drawings and complete the atmosphere of the world, but it was very interesting work. (Hiroyuki) Imaishi and (Kazuya) Tsurumaki are amazing. For the 5th… I wonder if I should say Tomcat’s Big Adventure? (laughs) It would be Ghost Hound. That was really hard to do. Ryūtarō wouldn’t really give me details, so the story I had initially thought it was differed from how the story actually progressed. It was interesting to work on while wondering what would happen next. After that, xxxHOLiC. It was interesting to think about supernatural monsters and mysterious people occupying a space different from ordinary life. It also wasn’t all digital, so I got to paint by hand as well. That was fun. ● It seems like all of the titles you listed are quirky. Are those kinds of projects most fulfilling for you? More so than fulfilling, I find it more fun to work on titles where I don’t simply adhere to one pattern due to the nature of the title. I like to push myself to think a little deeper about the title, and further refine my output. Hmm what else… Basically, how do I convey a sense of realism or a sense that the characters actually lived in a world that doesn’t exist? That’s why I didn’t really think of Tomcat as a cartoony endeavor, even if it actually was. I thought it would be interesting to have elements as though that wasn’t the case. That’s what made it fun. At one point someone remarked that I like painting buildings, and I responded back, “not really.” I don’t like painting buildings (laughs). ● Finally, is there anything you’d like to say about Tomcat’s Big Adventure, 20 years after you worked on it? There aren’t projects like this anymore. Although it may be the case that I haven’t personally seen this style of anime recently—specifically, its usage of these kinds of characters—I think this style of anime should still exist. Nowadays anime is quite varied, but there’s nothing like this. No one is even trying to make something like this. It’s fine to get excited over pretty girl characters and that sort of thing, but I think it’s also good to have anime that doesn’t have those elements. In other words, again I’d like to say that anime like Tomcat’s Big Adventure are good too. Maybe one day someone will watch it, and be inspired to create something similar. Ever since those words were uttered, a lineage has been left behind of anime background artists from Shichirō Kobayashi to Hiromasa Ogura. 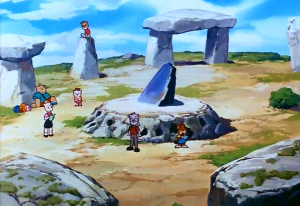 We also have a glimpse of the future of anime background artists to come. When watching anime, one’s eyes are naturally drawn towards the characters and story. 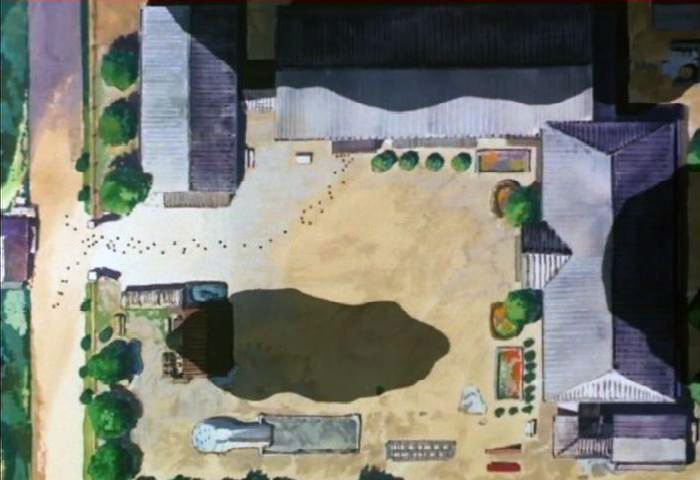 However, if you focus on the backgrounds, you will discover another fresh, fascinating aspect of anime. In this interview we got a glimpse of the rich mind of a creator’s world. I’d like to thank art director Ogura so much for giving me the time in his extremely busy work schedule to conduct a relaxed interview from beginning to end, even though we went way over time past what was arranged. 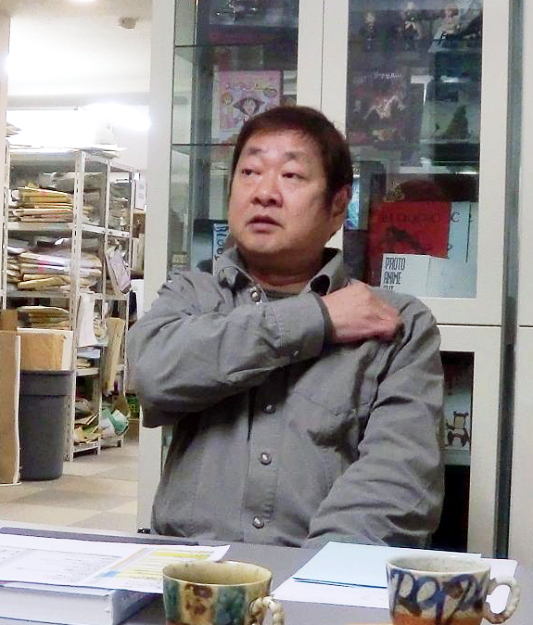 Source: Tomcat’s Big Adventure: Tom’s World Interviews: Hiromasa Ogura Interview Part 1, Part 2, Part 3. For more on Hiromasa Ogura’s background, his experience with titles like Patlabor and Ghost in the Shell, the influence of Blade Runner on himself and the anime industry, check out this recording of a live interview event hosted by the Japan Foundation in Sydney. Unfortunately, it gets cut off in the middle of audience Q&A, where he is just about to answer which project in his career is his favorite and why. Thankfully, we got the answer in the interview you just read. 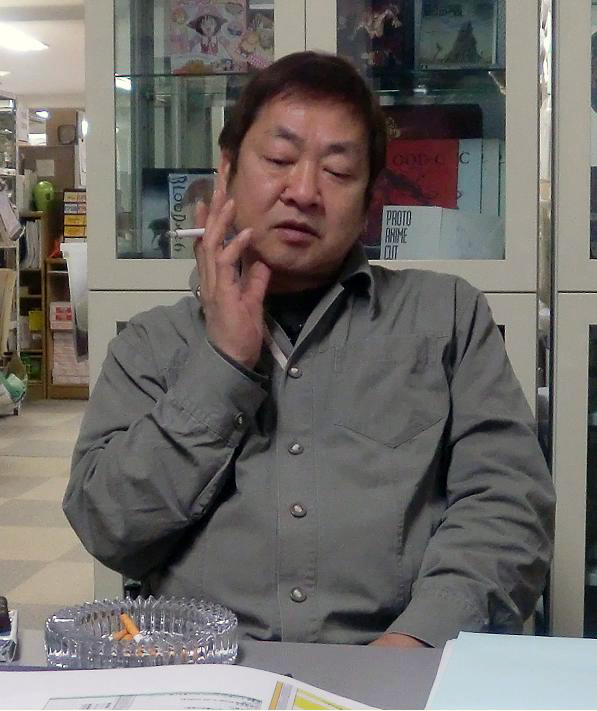 Tokuhiro Hiragi: CEO of Bihou Inc., the company responsible for the background art of many anime and games such as Neon Genesis Evangelion (TV series, movies), Gurren Lagann (2007), Tales of Destiny (2006, PS2 game), and others.